Great British Bake Off | what? bread? 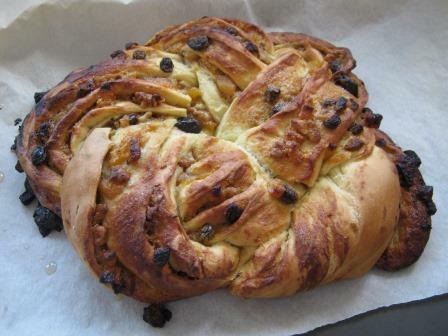 It was sweet bread week on GBBO last Tuesday. There’s not much I like more than sweet, fruity buns and breads so this was one of my favourite programmes in the series so far. 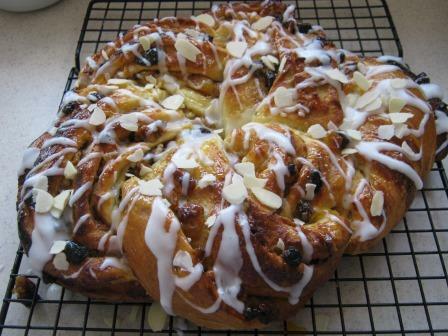 The technical challenge was a Paul Hollywood recipe – the apricot couronne, which just means ‘crown’ in French apparently. 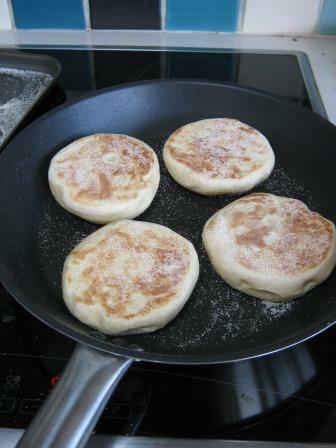 The recipe can be found on the BBC Food website here. Regular readers will know that I don’t much like all the salt that Paul Hollywood puts in his breads, so the first change I’ve made is to reduce the salt by half, just a half a teaspoon of salt flakes for me please, ground in my pestle and mortar. I also use fresh yeast, so that’s 14g of that, and this time I’ve mixed it with the milk and egg before adding to the dry goods. 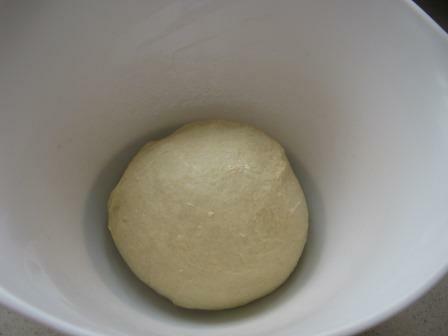 before putting back in the bowl for the rise. 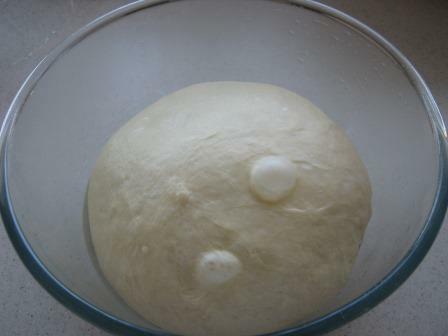 I’ve also used the milk and egg straight out of the fridge so it was pretty chilly and I hope the extra handling at the third knead has put some warmth into the dough. Next time, I’m going to try and remember to use the milk and egg from ambient as we’re heading into winter and my kitchen is not the warmest. 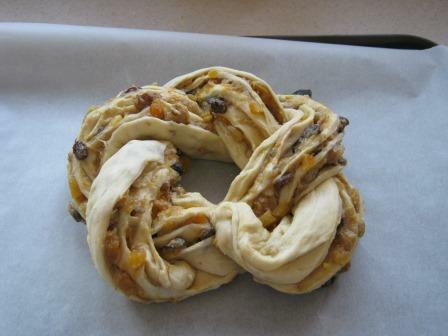 The filling consists of butter, sugar, apricots, plain flour, raisins, walnuts and orange zest. 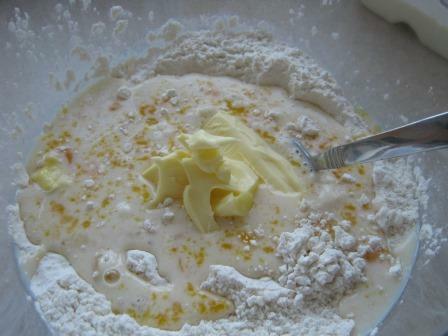 I have tried the recipe before and forgot to put in the flour because I was in a bit of a rush, the result was edible but a lot of the butter ‘fell’ out of the crown while it was baking and made a gooey mess on the baking paper with some of the sugar, which burned. 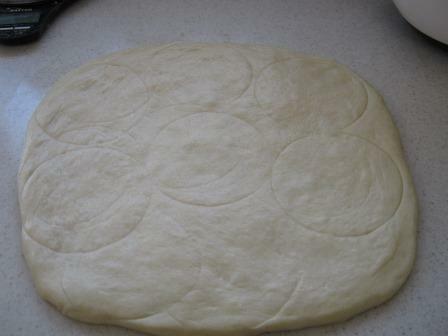 So lesson learned, I measured out all the ingredients while the dough was resting, remembered the flour and I hope the butter doesn’t fall out this time. 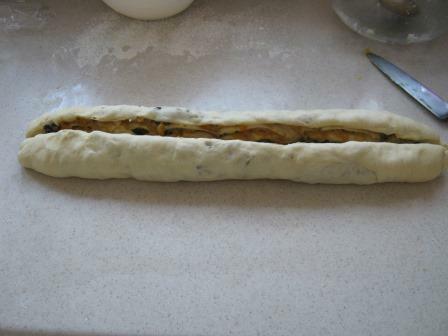 It is unusual to see flour in the filling paste, usually there’s some spices but this recipe doesn’t seem to have any. In another diversion from the recommended ingredients I have slightly reduced the apricots because the bags of pre-soaked apricots contain 200g, so I’ve used half a bag of those, 100g instead of the listed 120g. I didn’t have quite enough raisins either, so I’ve made up the quantity of fruit with dried cherries. 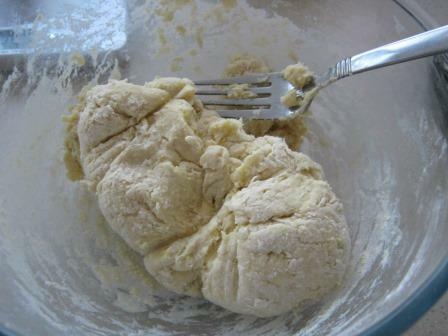 There’s another recipe on the BBC site that also contains marzipan, that could be nice nearer Christmas I think. and then did the twisting. Paul Hollywood liked the ones on the show that were open and where you could see the filling, so I tried to get the layers open. Getting the beast on the tray is a bit of a wrestle, as it is all quite soft. The second rise in the plastic bag was for about half an hour or so, then it went into the top oven as I was roasting chicken in the big one. a few burnt bits of fruit round the edge, but the butter and sugar pretty much all stayed in, then on to the cooling rack, some apricot jam and icing drizzled on it, topped off with nuts. I can’t wait ’til tea time. Very pleased to see that the bread episode was early in this series. 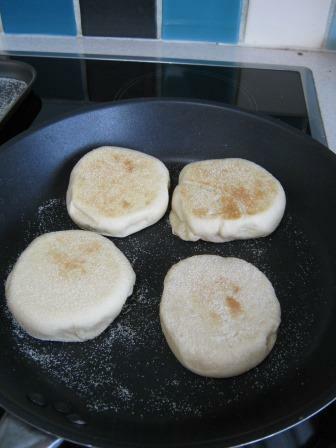 English Muffins are a useful ‘frying pan’ bread that is baked on the stove top, so no need to heat the oven. Having just seen last year’s electricity bill I think I’ll be economising a bit more on how much goes in each oven load and looking at other ways of baking. Now, how can I persuade himself to build a wood-fired oven in the garden? 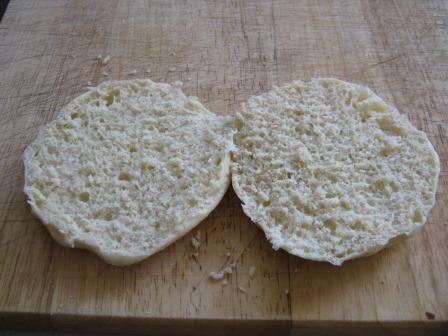 There is a method in the back of the River Cottage bread book if you’re looking for one. Moving on, we don’t need that for this. The recipe is available to download from the BBC here. 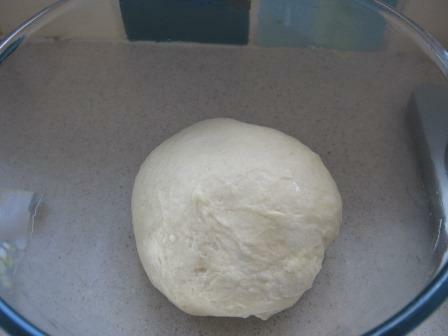 The only variation I have made – changing the dried yeast to fresh – I doubled the quantity to 12g. There was talk on the programme about scalding the milk, but as this recipe doesn’t tell you to do it, I didn’t and used cold semi-skimmed milk out of the fridge. so I gave it a 10 minute Dan Lepard rest and then returned and kneaded it for about 5 minutes before putting it in an oiled bowl to rest. The recipe said for at least one hour to double in size. Which gave me a chance to go and measure all my cutters to see which is 9cm in diameter, and then find that I have 8.5cm or 10cm. So going with 8.5 cm. One hour later … dough seems to have doubled so I patted it out and tried to work out how we were going to get 8 muffins out of it. Then it is left for another 15 minutes. I cut the muffins, can you see where I had to bodge one? and the misshape bits? 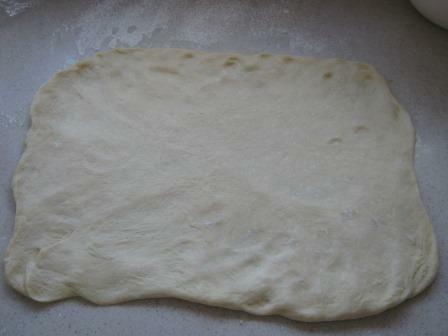 Then they rested for half an hour before I could start experimenting with the temperature setting. 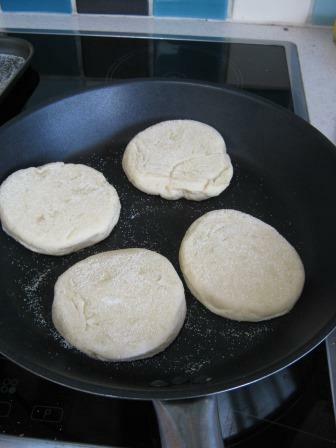 The recipe says low, so I started on 4, after 6 mins the first four were quite pale, so I turned it up to 5 and did the other side, and then flipped the others back again. 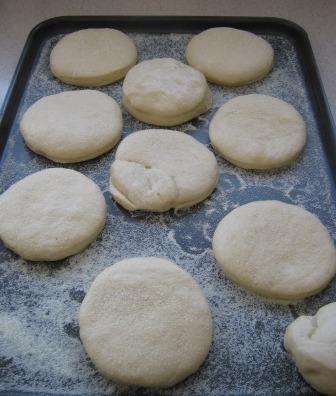 By the time the second batch were ready to go in they’d had quite a bit more rising time. By now I was on level 6, and this was a bit hot as after 3 mins the bottoms were quite brown, so I flipped them and then did the other side and turned it down. And by the time the final lot were ready to go in, the last one was rather large! So, quite pleased, a bit of a faff and because of the different amount of rising time, they won’t end up the same size when cooked unless you have more than one pan on the go or a very big pan or a hot plate! 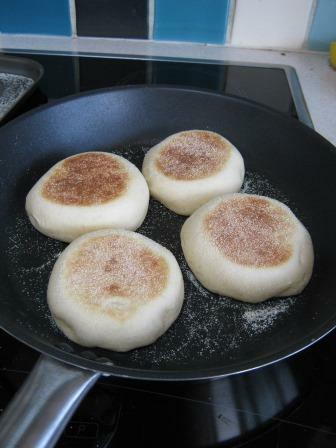 We’re eating these with bacon for lunch. 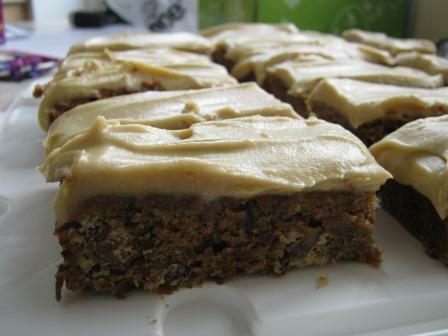 While we’re marking time waiting for the next UK series of the GBB, here’s the Sticky Toffee Traybake. I think you’ll have to get the book as I can’t find the recipe online. A very easy recipe, you boil some chopped stoned dates with water and bicarbonate of soda (which makes it very frothy!). While that’s cooling there’s a bit of butter to be creamed, then some light brown muscovado sugar, then some eggs, vanilla extract, flour and walnut pieces. Then while it is baking you make a caramel topping with more light brown muscovado sugar, butter and double cream, which is left to cool while the cake cools. Then when everything is cool you beat some mascarpone – don’t skimp this bit as the topping goes lumpy otherwise (trust me I’ve been there). 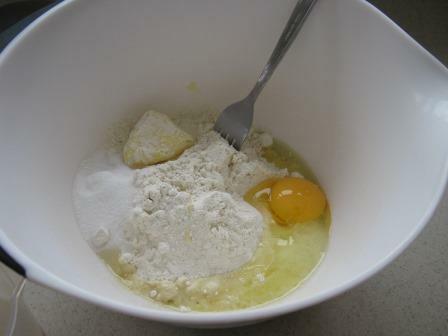 Then you add the caramel and some salt and mix and apply to the cake. As Bakewise points out the cake is good enough to eat without the topping. I’ve made this a couple of times and the topping is very soft and squidgy so it doesn’t travel well. But it is rather nice! 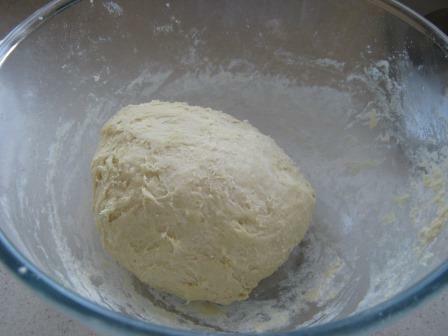 As I’m ahead of myself this weekend I may bake some bread this afternoon, or tomorrow. Yesterday I biked a stupid distance, so I’ve got a day off the bike. Sometimes I think I think too much about baking. However, I do think that bakers should think a bit about what goes into their bakes and what it contributes to the diet (in the old-fashioned regime sense of the word rather than the current emphasis on weight loss) of the person or people eating it. Sweet stuff is of course a treat and should not be a staple part of any regime, although sometimes I argue that cake is one of the major food groups along with protein, fruit and veg, carbs and fats but it really should only be the thin slice on that food plate the health people would have us use. Readers of previous ramblings will know that I often cook with older cookbooks that have a bit of a wholefood spin to them. And on balance, that’s pretty much where I like my cakes and breads and stuff to be, full of interesting tastes and textures and hopefully not doing too much damage to anyone. Now I know I’m swimming against the tide here most days because yet again popular new books are all about the ‘look’ and not about the contents and what that contributes to the diet. I will admit to making too many rather worthy chewy efforts in the past, and I try to look for the more inspiring ones these days. However, you probably won’t find cup cakes here unless they have something special about them not just a fancy topping. So this week I have baked the caramel layer cake from Great British Bake Off’s latest book. I halved the quantities because it is a mighty thing. You can find the whole recipe on the web here (but please come back if you go there!) and we did manage to eat half of it before I caught it for a photo. So, that’s all well and good but it is a lot of butter and sugar all in one place and while it does taste lovely it is a lot of ’empty calories’ that I’d rather not eat myself. I thought about having something a bit more nutritious about the house too. A recent census of the kitchen cupboards revealed a pack of dried figs I’d forgotten about so I cast about for a recipe to use them up and found a Dan Lepard cake, cinnamon honey fruit cake which luckily for everyone is available online for free as well as in his book “Short and Sweet“. 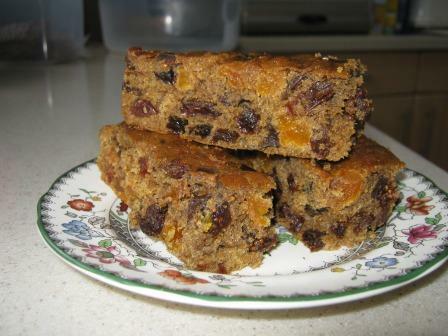 What a difference in the ingredients – raisins, apricots from Daily Bread, figs, not much butter, honey, brown sugar and treacle! Dan suggests a tray bake so I did that baked it for about 45 mins and it made 16 lovely solid slices of goodness. That’s a lot for me to eat if the others here don’t like it but I’ve also put some in the freezer for another day. 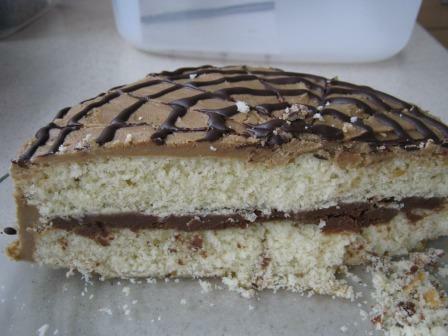 What ever your favourite is, remember cake is a treat not a staple food group. Writing this while ‘enjoying’ Terry Leahy on Desert Island Discs, sadly his taste in music so so apt for Tesco, middle of the road and cheap! Must remember to put a link up when it’s available! Listen again. A busy weekend and as I’d ordered ‘marmalade kits‘ from Riverford Organic for delivery last week, I thought I’d better check out the cupboard and see if there was any of the 2012 vintage left. Just a word about ‘marmalade kits’ – they are just some Seville oranges and lemons in a paper bag with a recipe, not a twee Cath Kidston sort of thing at all. More on marmalade recipes to follow. There were two jars of 2012 vintage marmalade left, so half of one has gone into a Great British Bake Off Sticky Orange Marmalade Cake. As usual, you’ll have to find the recipe yourselves because I don’t think its available from any reputable source, but it is available online in various places as everyone and their dog seem to be making it just now (move over chocolate crackles), and if you can’t be bothered, it’s just a three egg sponge recipe with a little bit of baking powder and salt, and three nice (that means heaped in my book)tablespoons of marmalade mixed in. 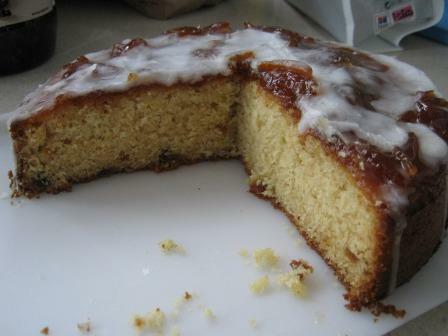 When it comes out of the oven, it cools and three more tablespoons of marmalade are warmed and brushed over the top. When that lot has cooled, some water icing is drizzled over the top. Dead easy, very yummy and I’m thinking of some additional flavour enhancers as I type, maybe some crushed caraway seeds or coriander seeds? 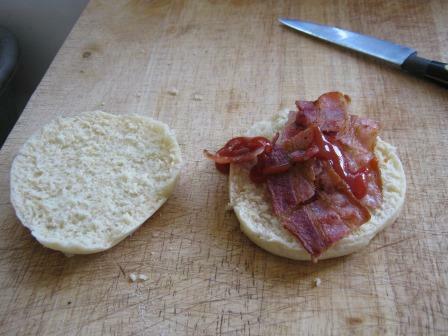 Anyway, this was plain and here’s a picture – note we managed to eat a lot of this before I remembered to immortalise it! 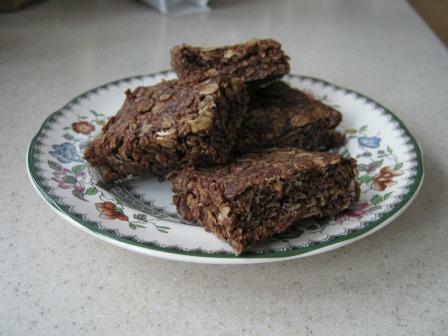 Also on Saturday I made some of Pat Ring’s Chocolate Flapjacks – again – please get a copy of her book. These are very simple and very yummy. Butter, light and dark muscovado sugar, golden syrup, porridge oats and jumbo oats, all stirred up and baked. Back to the marmalade production. 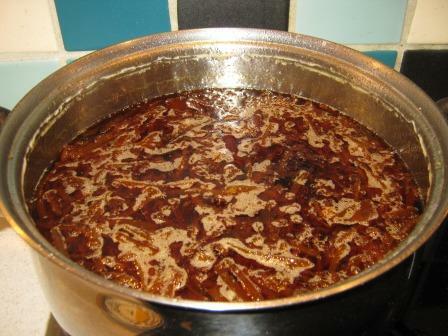 The recipe I use follows Delia’s for Dark Chunky Marmalade. Poaching the fruit makes it really easy to slice up, and you can do the whole thing in stages over several days. You also don’t waste very much of anything with this recipe, just the lemon peel and the pips and pith from the insides of the fruit. I don’t have a preserving pan but find this quantity will just fit in my casserole pan. 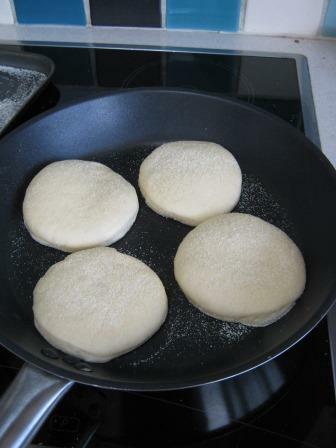 Here’s some pics showing the progress from raw fruit, through boiled to chopped and back in the pan with the sugar. I also don’t bother with heating the sugar first as Delia recommends, life is too short for that. The Riverford recipe seems to start with cutting up the oranges into tiny pieces. That also sounds like too much hard work, it’s very much easier when they fruit is all squishy after poaching and only takes about 10-15 mins for a full batch. It does take quite a long while to boil up to setting point though, so if you’re thinking of having a go, do make sure you’ve got plenty of time and patience on hand while it boils away, Delia says about 3 hours and I think that’s about right. It’s like being in an orange scented sauna in the kitchen here. Around 11 pounds of deliciousness – and yes I do use old jars when I’m making for family, you’re not supposed to if its for sale anywhere. My aging ancestor seems to live on tea and toast with marmalade so most of this batch will be going to him and I’ll make the rest another day. 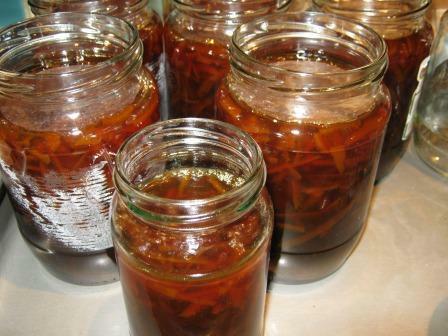 My Great Aunt used to make grapefruit marmalade which was very bitter and I’m ashamed to say we did struggle to get through a jar of that before the next year came round and she presented us with more. Over the last 3 years the Daily Mail has run stories that say that sales of marmalade are falling. Personally, I would like to believe it is because we’re all busy making our own and not buying over-priced ‘designer’ marmalades or, perish the thought, Golden Shred. I just loathe those little pots you get in hotels, thin, tasteless stuff, nothing like real marmalade. The Dalemain Marmalade awards usually manage to bring about some positive publicity for marmalade, and good luck to all the entrants this year. While I’m here I’ll say a few words about Seville. If you’ve never been, do think about going. We went in 2001, just after the 9/11 attacks and had a top time. There’s quite a bit to see, particularly if go during one of the religious festival times, including the festival of San Miguel in September. And you can even buy marmalade from the nuns. 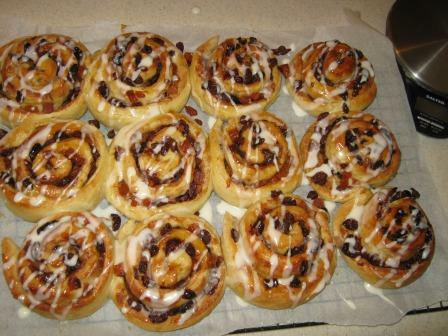 As I wrote over here I have been trying out chelsea bun recipes. A week or so ago I tried the Paul Hollywood recipe in the latest Great British Bake Off showstoppers book, and due to lack of attention managed to remind myself that heating milk to too high a temperature is a very bad thing when buns are involved and I may have managed to kill off the yeast so the dough didn’t rise much and was a bit tough – so no picture here and lesson learned. This afternoon I had the chance to try again and used the technique I have for heating water to the correct temperature which was to heat one third of the milk to boiling point and then add the remainder as cold milk. There may be those that say that all milk should be scalded before baking becuase it changes the proteins and doesn’t denature the gluten. A quick glance at wikipedia reveals that pasturised milk has already been at over 70 deg C, albeit for a short time. Who knows what effect that has on the proteins and what not. Anyway, today the recipe worked and I made a batch of 12 from the recipe which suggests it does 10, and they came out pretty much as one would wish. 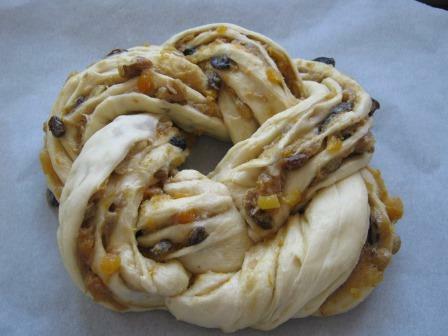 So what have we got here – a soft, rich dough made with milk and an egg, and a filling that includes melted butter, orange zest, light brown sugar, chopped apricots, sultanas and cranberries. They are topped off with a glaze of apricot jam and then splashed with glace icing, and here I diverged from the recipe and used some orange juice instead of water and orange zest (so there PH!). So not traditional, but very tasty and I commend them to the house. In the name of raising money for charity we have had cake making competitions at work, where we taste samples and vote for our favorite to add a bit of interest to just eating cake for charity. We were raising money for McMillan Cancer Support and will have got well over £100 from three sessions of cake-off. I’m not entirely sure we wouldn’t have made more money if the bakers just put in the cost of the ingredients to the fund, but it’s been a bit of fun and almost a quarter of the people who work where I do have made a cake or cakes. We have previously baked carrot and also chocolate cakes as these were people’s favorites. 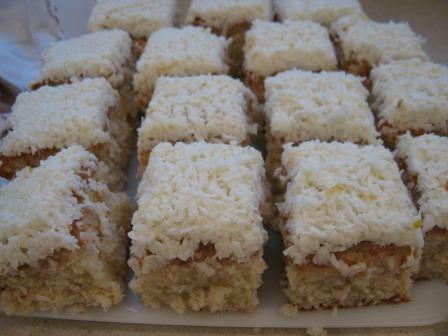 I tried the lemon coconut traybake recipe in the new Great British Bake-off showstoppers book. Very easy, quite tasty and could be a bit more lemony, maybe I needed larger lemons. And I came third out of six entries with this. I recently got a like for a blog from http://en.gravatar.com/heirline. Be very careful who you go liking people, I might end up telling you all about my Gt Gt Grandfather who was on the last ship of convicts sent to Western Australia in 1867, and that would be truly off-topic and not about bread or baking at all. A very quick blog on some things I have made recently. Breadmaking is taking a back seat while I continue my love affair with cake! 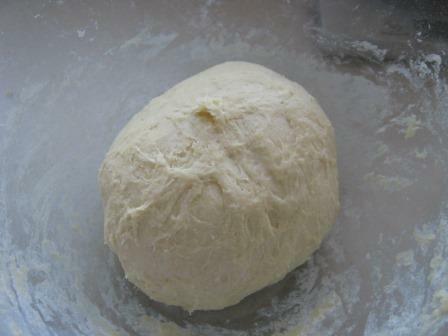 I am still baking our daily bread but it’s a bit repetitive just now. Sometimes Dan Lepard comes up with ideas that are pure genius. Gingerbread rock cakes are one of them. 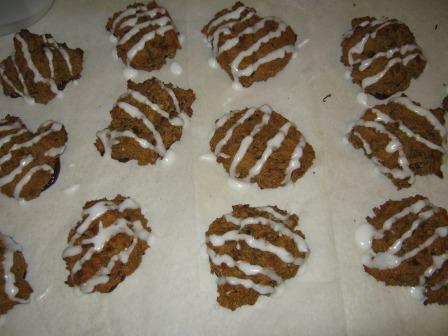 I made these last Thursday, they were quick and easy to make and the recipe made a generous 21 in my hands. I put dark chocolate on the base and drizzled lemon water icing across the top, although Dan only suggests one. 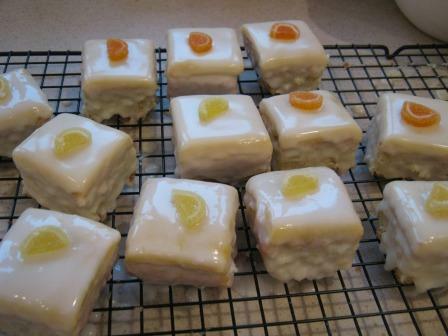 And yesterday I made the fondant fancies from the latest Great British Bake-off Showstopper book. These have orange zest in a Genoese sponge with a pinch of cardamom, orange water icing on top of a layer of marzipan which sits on a layer of marmalade. I make my own Seville orange marmalade and still have some left from earlier this year, so that was good. 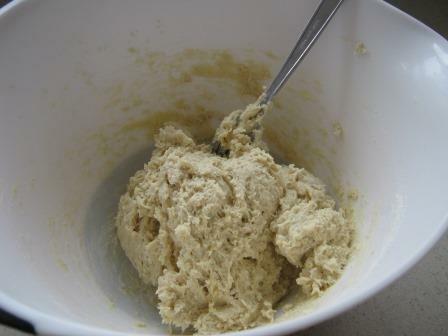 The Genoese sponge was interesting as it takes a bit of whizzing of eggs over a saucepan of hot water and it all went quite frothy which was good, I hadn’t made it before but it went OK. It’s also quite a low fat recipe, with only 50g of butter for 16 cakes. Another time I’ll make my own marzipan and maybe use a bit less, but as a proof of concept exercise it sort of worked out OK. The icing was a bit fiddly and I’m glad the recipe didn’t use buttercream as well, although I’ll be watching the Bake-off masterclass tonight to see how it should be done.